HERSHEY, Pa. — A third of adults ages 40 to 59 have high blood pressure, or hypertension. So do nearly two-thirds of the population age 60 and older. That makes high blood pressure among the most common medical conditions in the United States. It’s also among the most treatable. Wile said people with high blood pressure are often told the news during a routine office visit. It is rare for people to have any symptoms, even from a moderate increase in blood pressure, so patients are often unaware that they have it. Age, ethnicity and genetic factors contribute to high blood pressure, but lifestyle factors, such as tobacco use, alcohol use, obesity, poor diet, a lack of exercise, or the presence of other health problems can increase an individual’s risk, as well. Blood pressure measures how much force the blood exerts against the walls of an artery each time the heart beats (systolic pressure) and when it rests between beats (diastolic pressure). The two numbers together form the reading taken at most office visits. 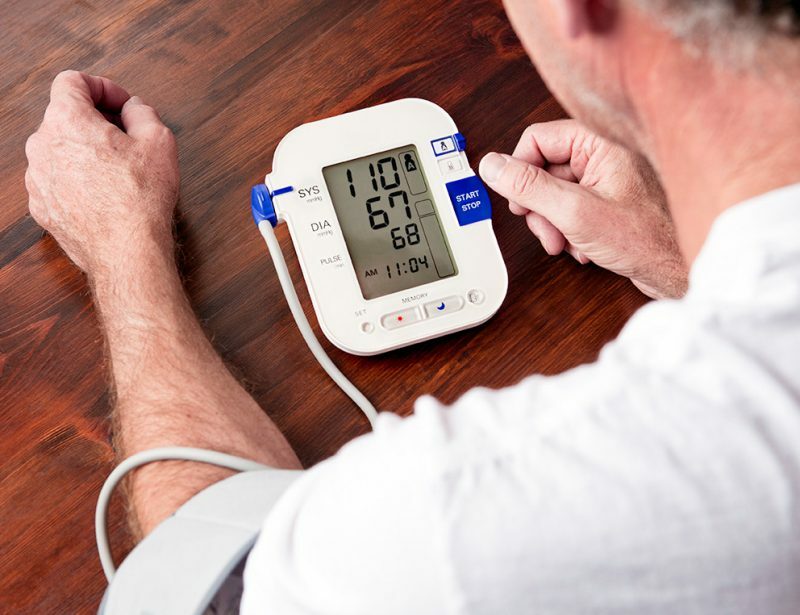 Although readings of 140/90 and higher are often used to diagnose hypertension, the line between healthy and unhealthy can vary depending on other factors like age. It’s natural for readings to fluctuate, but multiple and consistent high readings are a likely indicator of hypertension. Once high blood pressure is detected, doctors work with patients to modify lifestyle factors they can control, such as smoking, alcohol use, diet, exercise and weight loss. They can also prescribe one of a number of common medications. People who have severely elevated blood pressure may experience symptoms such as headaches, fatigue, confusion, vision changes and chest pain. “Those are big red flags,” Wile said. He advises patients to adhere to the Dietary Approaches to Stop Hypertension eating plan — which features fruits and vegetables and limits dairy and saturated fats — to help control high blood pressure. “Even if you are not losing weight, it helps,” he said.